We approach every project with care and professionalism, regardless of its size and scale, striving to provide customers with a quality end product that fully satisfies their exacting requirements and expectations. 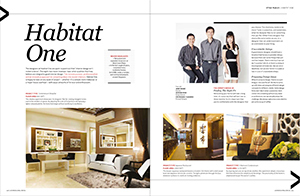 Interior design is more than putting paint on the wall, as a premium interior architect in Singapore, Habitat One incorporates design concepts that will reflect your identity, after all, your home is a big part of you. With extensive knowledge, our interior architects will implement design and installation techniques that will enhance the value of your home. We involve you through each stage of our interior design process from design conception to execution; this allows optimum participation with you. As your selected renovation company we put customer relationship in the fore front, keeping communications channels open to you with timely reports and updates. We take great responsibility with every project to ensure you as a customer is satisfy with your home renovation. Interior design is more than putting paint on the wall, as a premium interior architect in Singapore, Habitat One incorporates design concepts that will reflect your identity, after all, your home is a big part of you. With extensive knowledge, our interior architects will implement design and installation techniques that will enhance the value of your home. We involve you through each stage of our interior design process from design conception to execution; this allows optimum participation with you. We emphasize on making interior design and transformation as simple, smooth and hassle-free a process as possible, giving costumers a peace of mind when they engage us. Habitat One works hard to provide all of our customers with a quality product that is to their satisfaction when the job is done. Our focus is on making the makeover and remodeling process as easy on our clients. Working with passion and professionalism, Habitat One takes an innovative and pragmatic approach to each commission and has developed a reputation for quality, dependability and client service. As designers, Habitat One is committed to the aspirations of its clients and its list of highly successful projects demonstrates this achievement.